In my experience crashing happens for only a few reasons. The first is an unhandled Exception which was serious enough to crash the Application Pool which is rare but does happen. The second is a recursive function or a set of functions that continue to pass the ball to one another with nothing stopping them. In my case this was the case. I had two functions that got caught in a loop and continued to run out of control until the server bottle necked due to CPU or memory usage. How do you know when your Application Pool Crashed? The details of this message tell us where the system dump was stored. Take note of this, as this will help you find the dump files you need. Next we go to our system errors on the event viewer. If you are running websites on your server then your system logs are likely to be very numerous. Every time a Application Pool starts or shuts down it will make an entry in your system logs. This is nothing to be concerned about. Many websites are set to shutdown the application pools after a website hasn't had any visitors for more than 20 minutes. This frees up the memory for other sites that do have traffic. But if you see any entries with the Yellow Warning this is not good. 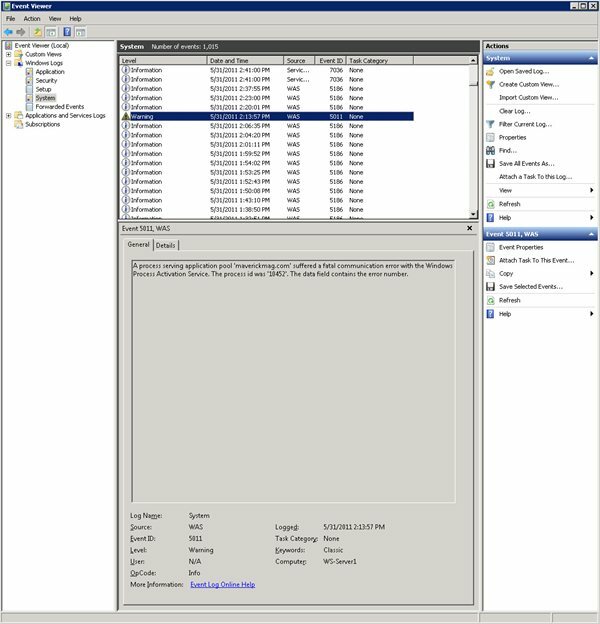 A process serving application pool 'yourwebsite.com' suffered a fatal communication error with the Windows Process Activation Service. The process id was '10452'. The data field contains the error number. The one you want is the biggest one. 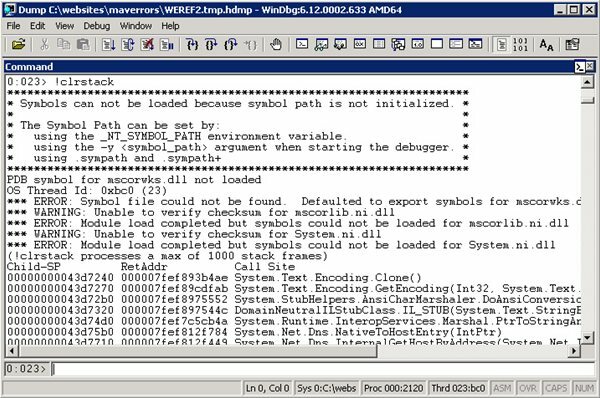 First if you don't have WinDbg on your system then you need it. This program will take your dump files and give you the stack trace, which can shed some light on where the problem lies. Unfortunately Microsoft has recently decided to put WinDbg into some huge 600MB+ ISO package. Forcing you to install the entire package to get just one little program. So after some hard searching I found the raw installers. In my case since I am running Windows Server 2008 R2 ( only comes in 64 bit ), I installed the 64 bit version of the WinDbg. After you install it, you will find it under Debugging Tools for Windows (x64). Also take note that I am running WinDbg off my production server. You would also download your Dump files to your local machine and try to debug them from there, but to keep things easy in case I ever needed to do some debugging on a Remote Desktop Connection using my cell phone I figured running them off my Production Server was ideal. What you are looking for is either a single function being called over and over, or maybe 2 or 3 functions that are running in a loop. At the top of the stack I don't see anything so I scroll down a bit. and the cause is right before our eyes. In my case I have two custom functions that seem to be passing control back and forth with no end in sight. The first is fixquotes, and the second is blacklistVisitor. fixquotes is a function that just cleans up strings before they are added to MySQL queries, and blacklistVisitor is a function that I setup to blacklist IPs that were attempting something bad ( like SQL Injection, or Denial of Service Attacks ). Unfortunately until I had a hacker attempt something bad, I had no idea that these two functions were stuck in a loop. Of course just a single instance wouldn't cause the site to go down. But if the same hacker tried over and over again this could create multiple errors and at this point IIS would assume something is wrong and shut the site down. Most likely you have a recursive function that is calling itself over and over, or you have several functions that are stuck in a loop. Hoping the steps I went through will help others find errors in their code. i been using the windgb tools x64 on our production server, cause were looking for an answer why the w3wp is crashing, and when i tried to load the 2 gbz file of the memory dump files..the tools says the cannot loadlibary(c:.....net frameworksosfailed..)..what is the problem with this..anyway our production server is windows server 2008 r2 installed with a framework 2.0..
You might need to install .NET 4.0 to get that command to run correctly. I recall running into the same problem and installing .NET 4.0 framework with all updates fixed the issue. Actually neo, if you get that LoadLibrary error you will need to install and run the 32bit version of WinDbg instead. i just run the windbg 32 bit on my windows 7 with framework 4.0 upon loading on the memory dump files with a size of 2 gigz its prompt some error its says again. Could not find the I:Installerwindebug x64 and x86 win 2008 r2 IIS crush dump files checkerappcrushdumpappcrushdumpmemory.dump Dump file, Win32 error On87 the parameter is in correct. what is the problem with this. You need to install DebugDiag that will allow you create a rule that will generate a dump file when one of your application pools crash. I had actually done that before I figured out I needed the WinDbg to actually process my dump files. I am going to try to update this article with details on installing DebugDiag and setting up the system to generate the dumps. If you need to manually create a dump file, for instances where your Applications are just consuming lots of CPU or Memory, but not crashing, you can do this by opening task manager, and then right click on the process in question and select "Create Dump File". However if this is to debug a application that is crashing then you will still need to install and setup DebugDiag to capture the dump files when the process crashes. Also, !clrstack -p showed the parameters and their values passed in the methods. This helped me to find our problem! I was lost before I found this post! Our issue was a home made url re-writer that at some point got stuck in a loop! You have no idea how helpful this post is to me. Thank You!!!!! We have a very similar problem with an application pool serving a web application on our WS2008 R2 SP1 Server. 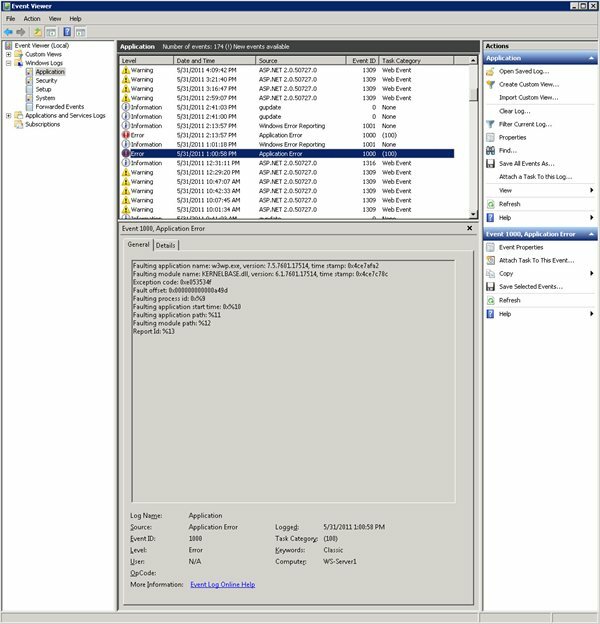 A process serving application pool 'EHK' suffered a fatal communication error with the Windows Process Activation Service. The process id was '1164'. The data field contains the error number. However no dump is created when this error occurs, because the process doesn´t crash, nor DebugDiag catches anything. Any idea how to diagnose and debug this kind of error, please? 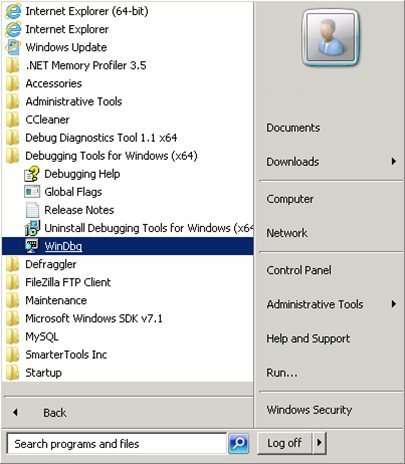 This page will show you how to install Debug Diagostics Tools, and how to set them up to force the system to capture a dump file. After you have the dump file come back to this blog for info on how to open and read it. This is exactly what I have tried, but still no success :-/ The W3WP process doesn´t crash, so no dump is generated via DebugDiag, and setting performance rule and generating the dump manually doesn´t work either, because the problematic W3WP process doesn´t hang forever - it causes 100% CPU usage for 60s and then dies Trying manual dump didn't bring anything interesting at all. 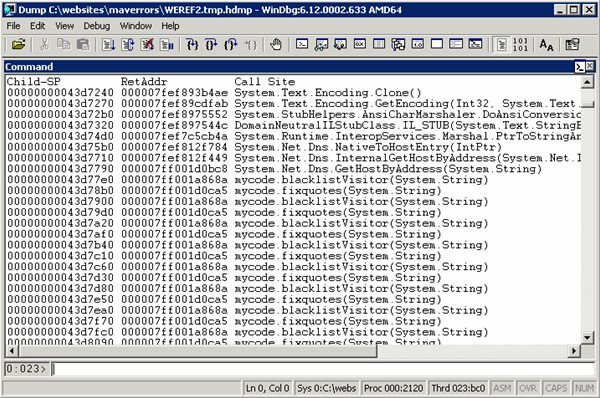 When I try to .loadby sos mscorwks it says "unable to find module mscorwrk"
There is a 32bit and 64bit version of WinDbg. Make sure you are using the right one for your application. @Paul : I used the right one. is there any other possible reason? It depends on the framework. Unable to walk the managed stack. The current thread is likely not a manged thread. You can run !threads to get a list of managed threads in the process. Please let me know what's wrong. I created dump file using dubug diagnostic tool. I really want to see stack to find out the issue. Is that the entire output? I don't see anything that looks like a recursive function call. Yes that's the entire output. I dont think it's a recursive function do you think is it anything else? I'm having this exact problems (same error codes) but receive no application log from Windows Error Reporting. I also looked in the C:ProgramDataMicrosoftWindowsWERReportArchive as show in the example..but no files. Do I need to turn something on the generate logs? I'm trying DebugDiag. Did read down far enough. @Paul, great article, thank you for taking the time to put this together. We are experiencing this exact problem. Everything you describe, in sequence. Sometimes we go days without, other times it will fault many times in a row (in a matter of minutes). Followed your instructions, however, when I browse to the AppCrash folder, the only file present is Report.wer. None of the other files you show (most notably, the main dump file) are not there. Can you think of any reason why this would be the case? Does something need to be enabled? Thank you in advance for any guidance you can provide. I am curious to finding out how to simulate such w3wp crashes? Please throw some light. Interesting question. The reason I would debug the W3WP, is because I don't know of the reason of the crash. In my case the issue was a infinite loop that only happend under certain criteria. If you are looking to simulate a crash, you could try to create an opperation that would do something similar, which would consume all your system's resources.